One of the most daunting things about flipping through an Indian cookbook is the long list of spices most recipes seem to have! Relax – it’s not as scary as it seems! Think about the spices currently sitting in your cabinet. You probably have five or six you reach for on a regular basis – perhaps basil, oregano, parsley, garlic salt, and celery seed. You probably also have a seasoning blend or two, such as an Italian seasoning blend or a chili seasoning blend. And quite a few others that you might use occasionally, but not very often and only for a few certain recipes – perhaps dill. It’s the same with Indian cooking. You need five or six essential spices, a spice blend or two, and a few fresh herbs and flavorings. The other spices may be nice to have, as you expand your repertoire, but not at all essential in the beginning. So! In this blog post I’ll be going over what I consider to be the essential spices and flavorings. Please keep in mind this Irish girl in Charlotte, NC was taught to cook by a Punjabi, so these are the spices that are most essential for North Indian food. The ones I reach for on an almost daily basis. South Indian foods rely on slightly different spices (for example, cumin seeds are a mainstay in North India, but mustard seeds are popular in South India). We’ll go over my “nice but non-essential” spice list in the next post. My absolute essentials are Sea Salt, Red Chile Powder, Turmeric Powder, Cumin Seeds, and Garam Masala (all bought in bulk). Small bottles of Ground Roasted Cumin and Ground Roasted Coriander would be my next choices, as well as Green Cardamom and Cloves for tea. Fresh herbs and flavorings I always have on hand would be Fresh Cilantro, Fresh Green Chili Peppers, Garlic or Garlic Paste, Ginger or Ginger Paste, and Onions. 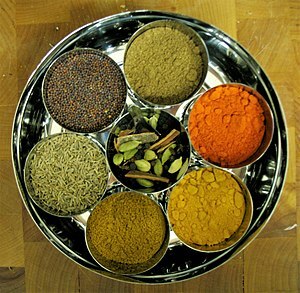 An added bonus – most spices used in Indian cooking have health benefits! Sea Salt. I prefer sea salt to table salt because it’s saltier. Regular table salt actually has dextrose (sugar) in it! Red Chile (mirch) Powder (also sometimes spelled Red Chili Powder or Red Chilly Powder). This is basically cayenne pepper, only hotter. DON’T confuse it with Mexican chili powder or chili seasoning blends – it’s not the same thing AT ALL! Health benefits may include lowering of cholesterol, boosting of metabolism, protection against blood clots, and even fighting cancer cells! Turmeric (haldi) Powder. This is a frequently used ingredient, not only for its flavor but because it imparts a really beautiful golden color to foods (making them appear much more appetizing). In addition to traditional Indian foods, I sometimes use it to add a touch of color to rice, potatoes, and absolutely anything tofu I’m making, whether it’s a tofu scramble, eggless egg salad, or stir fried tofu. Turmeric has amazing antiseptic and antibacterial properties, is an anti-inflammatory agent, and a natural liver detoxifier. It may help prevent or slow the progression of cancer and Alzheimer’s disease, and has been used in Chinese medicine to treat depression. Just be careful when using this spice because it will stain your hands and clothing, and can sometimes be a little tough to get off countertops. I never dreamed my 60’s-era yellow laminate countertops would one day be a blessing in disguise! Cumin (jeera) Seeds. I buy these in bulk and use them up quickly. You cook a handful of these in a little oil until they turn brown and start popping; then you use them (and the oil) to flavor rice, potatoes, or any number of vegetable-based dishes. It’s quite a different taste than the ground cumin you may be used to. I also keep a small bottle of ground roasted cumin (which also comes in handy for Mexican dishes and American chili). Cumin is a good source of iron and magnesium, aids in treating digestive problems, and may help control diabetes. Garam Masala. (Garam means hot or intense and masala means mixture.) A North Indian spice blend, added toward the end of cooking, that lends an intense, complex taste. It is comprised of many different spices ground and mixed together. It usually includes peppercorns, cloves, coriander, cumin, cardamom, cinnamon, and possibly other spices such as fennel and bay leaves. Buy it in bulk and try a bit on non-Indian foods as well – it’s awesome on macaroni and cheese. Coriander (sabut dhaniya) and Fresh Cilantro (dhaniya). It took me a while to realize both spices come from the same plant – coriander is the seed and cilantro the leaf. I keep a small bottle of ground roasted coriander on hand for recipes, and a big bunch of fresh cilantro in the fridge for garnishing dishes. Fresh cilantro adds the perfect finishing touch to a number of dishes ranging from rajmah to chickpea salad. You may have gotten tired of cilantro in Mexican dishes, but trust me, it tastes different when paired with Indian foods! Never, ever use dried cilantro. Both the seed and the herb aid in digestion and may help control blood sugar levels and diabetes. Fresh Green Chili Peppers – I probably buy a pound at a time and the little buggers usually migrate into every dish – even the non-Indian ones! For instance, a pepper might mosey its way into a pot of grits or the Vegenaise spread on top of a veggie burger. Be careful not to accidentally rub your eyes after chopping these (I learn this lesson afresh every few weeks or so!) After chopping peppers, I wash my hands with dishwashing soap to remove the pepper residue. Garlic (lassan) or Garlic Paste – Never use dried garlic flakes or garlic salt to flavor Indian food! Use fresh garlic cloves or, to save time, you can buy a bag of peeled garlic cloves at an indian grocery, or a 28 oz. jar of garlic paste – both retail for about $4 in Charlotte. If you choose to use garlic cloves, invest a little money in a good garlic press as well. Garlic is said to be a natural antibiotic. Ginger (adarak) or Ginger Paste – Since I use so much ginger, I always have a jar of ginger paste in the fridge. Ginger is also great for digestion and sore throats. If I have a sore throat I’ll buy a bit of fresh ginger root and make ginger tea. Onions (pyaz) – Keep a supply of fresh onions on hands. You need red or yellow onions for cooking. Sweet Vidalia onions will not taste right cooked in Indian dishes (too mild), but I like to use them uncooked for cold chickpea salads and kachumbar, or as a garnish. Whatever you do, never use dried onion powder! Onions contain quercetin, said to help prevent cancer. Green Cardamom (elaichi) Pods – Used for chai (spiced tea) and desserts. White cardamom is just bleached green cardamom, so choose the green pods to avoid the chemicals! Also, be aware that green cardamom pods are quite different in flavor from black and brown cardamom pods, which I believe are used mostly in meat dishes. Cloves (laung) – Also used for chai and desserts. Said to be a natural painkiller. And that’s all you need to start cooking!! !